This should infuriate every American out there, not just conservatives. 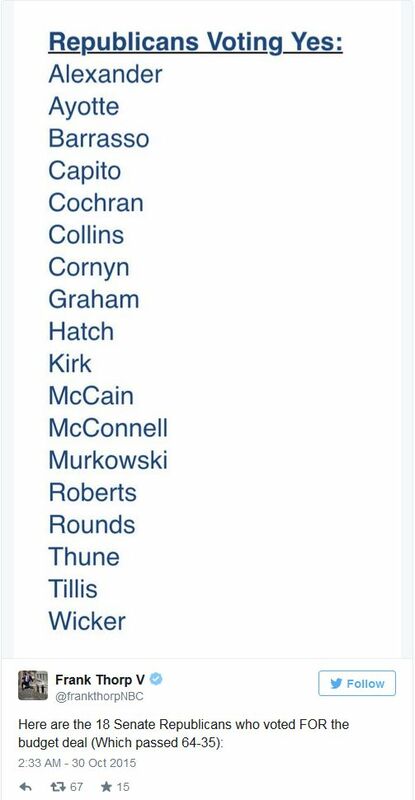 What Mitch McConnell just did in league with John McCain and Lindsey Graham is nothing short of treason in my opinion. Under the cover of night, the Senate voted to approve a budget deal that gives Obama unlimited spending power through the end of his term. The legislation will suspend the current $18.1 trillion debt limit through March 2017. The budget portion would increase the current “caps” on total agency spending by $50 billion in 2016 and $30 billion in 2017, offset by savings elsewhere in the budget (that’s a joke). It will also permit about $16 billion to be added on top of that in 2016, classified as war funding, with a comparable boost in 2017 (probably siphoned off to our enemies). We are broke and they are printing money and spending like there is no tomorrow. Maybe there’s not. 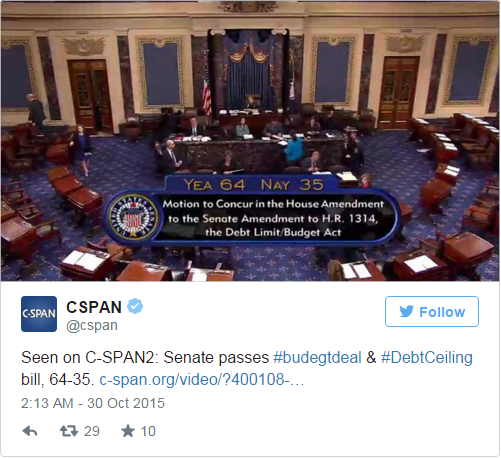 The U.S. Senate voted 64-35 early Friday morning to approve a budget deal that would raise the debt ceiling through 2017, effectively ending the threat of a government shutdown until after the 2016 presidential election. 18 Republicans ultimately joined with the Democrats to push the legislation through Congress and send it to President Barack Obama’s desk for his signature. 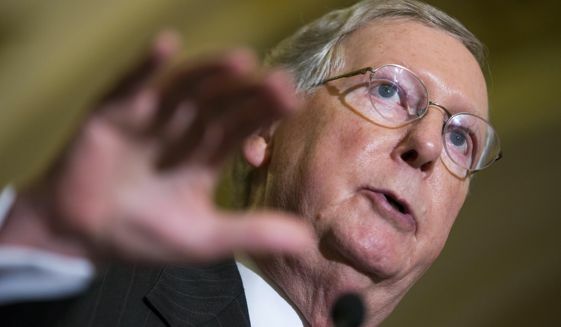 Senate Majority Leader Mitch McConnell (R-Ky.), Sen. John McCain (R-Ariz.) and Sen. Lindsey Graham (R-S.C.) were among the Republican senators who voted in favor of the deal. Sen. Rand Paul (R-Ky.) had vowed to filibuster the deal, but was unable to successfully stop it after the same 18 Republicans joined with the Democrats to invoke cloture. Nevertheless, the libertarian firebrand and Republican 2016 contender railed against the deal in a fiery Senate floor speech before the final vote. “The establishment in Washington is completely and utterly tone-deaf to the way America feels about this,” the Kentucky senator said. 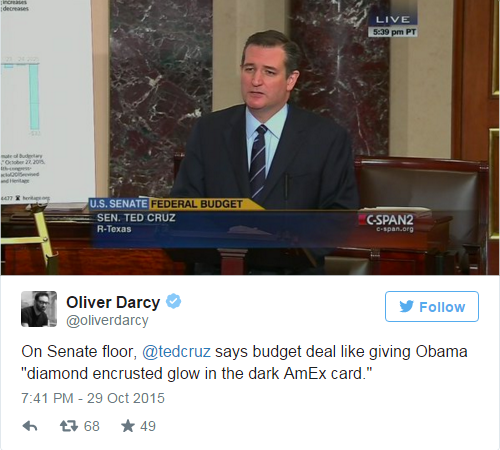 Earlier, Sen. Ted Cruz (R-Texas) compared approving the budget compromise to giving Obama a “diamond encrusted glow in the dark AmEx card” that would be paid off by future generations. Sen. Marco Rubio (R-Fla.) voted against the deal and motion to invoke cloture, but did not deliver a speech on the subject. The House approved the legislation on Wednesday. Rand Paul, who I don’t care much for these days, at least had the backbone to filibuster until the Dems closed him out. Ted Cruz was right there too bucking the RINOs and the Marxists (who can tell the difference any more?). At least Rubio voted against this monstrosity. “This deal represents the worst of Washington culture,” said Rep. Rand Paul, who vowed to lead the filibuster, but who saw his efforts fall short to what he called an “unholy compromise between right and left.” Told you so, Rand. President Obama said the deal will “break the cycle of shutdowns and manufactured crises” that he and Congress have been through the last few years. It will indeed do that – it will utterly destroy the system, so they can stop manufacturing crises. A shutdown will be the least of these treasonous bastards’ worries in the end.